I just can't help myself. When it comes to supporting you guys—you crazy, dream-filled artists and entrepreneurs—I'd do anything to encourage you to chase your dreams in the most ambitious way possible. I'd even roll out of bed and take a photo in the bathroom mirror, no makeup, dirty hair and not even a drop of coffee to give me a decent "awake" look. And then I would share it with hundreds of people. I'm doing this because you're making a huge mistake. Would you roll out of bed, LIKE THIS, and meet up with your ideal client? Would you put on a face mask, throw up a topknot bun, and promote your business at a networking event? Would you let this silliness be the literal face of your business? Then why would you let the face of your business online—your brand photos—function the same way? You should be putting your best face forward when it comes to photos that represent your brand. —"People tell me I'm too expensive." —"My clients are asking for something completely different than my style." —"I haven't had an inquiry in weeks." Here's the harsh truth: You're attracting the wrong clients—or no clients—because you're not putting your best "brand face" forward. The photos you post don't tell your brand story in a clear, consistent way. "But my friend has a fancy camera and likes to take photos, so she did it for fun. The photos are really nice!" Yes, they're nice photos. But crafting a visual message (i.e. the story you tell with photography) that consistently attracts your ideal client takes something more than nice. If you're relying on amateur photography to connect with your ideal clients, then you're making a huge mistake. Amateur photography only attracts "amateur" clients: The ones who don't want to pay full price, constantly ask for a discount, don't put their full trust in your expertise and micromanage your end product. People, these days, are quite photo savvy. They know when you've invested in professional photos and when you've handed the job to an amateur. And when they see your "nice" photos, they think, "If she won't put her money behind her own work, then why should I?" Bottom line: If you won't put your OWN money into your business, neither will your clients. What you need is skilled brand photography, which turns your brand story into a visual message that is unique, purposeful, effective and empowered. You invest a lot of money, time + energy in your business—your photos should be no exception. Your brand photography is just as important in creating a successful business as all the other investments you make. "I need to lose 10 pounds!" When you start out as a creative entrepreneur, there's one major thing no one tells you: You're going to have to step in front of the camera. Like, a lot. Branding photos aren't just about photographing your products with the right colors. They're so much more than that—they're an expression of your brand, your story, and the experience your clients have with your business. And there's no one who will represent that experience and feeling better than your brand's fearless leader. That's you. Ok, I hear you: "I'm not a model!" "I'm so awkward in front of the camera!" "I have no idea what to do with my hands!" "I have to lose 10 pounds!" "I'm not photogenic!" Here's the thing: No one is born camera ready. So today, I'm sharing my top 4 tips to being a faaaaabulous model for your own brand. 1. "I'm not a model!" First of all, reality check: Models and celebrities don't wake up like that. After living in Los Angeles for 10+ years, and seeing many celebs without makeup at the grocery story, the yoga class, Runyon Canyon, etc., I can promise you—they aren't born looking like models either. It's mostly smoke and mirrors, and a killer glam squad. So yes, you can look like a model. And with me behind the camera, you can pose like one. Well, it's a little more complicated. I'd never actually put you in a pose. The reason you look awkward in photos is because you're trying to capture yourself in a moment, and trying to freeze that moment with a single pose. Nuh-uh. Not working. Instead, you should be moving. Those beautiful moments you're striving for? They usually happen in the middle of an action: laughing at a joke, sweeping your hair off your face, walking to the boutique, etc. These moments can't be faked, they have to be genuine or else, yes, they'll be awkward. You need to get moving and get excited, and those moments will come naturally. Babe, yes you are. Before you start to argue, let me say this: It's all about the angles. Every person really does have a "good side." How can you tell? Well, two ways: All of us have one eye that is a little higher than the other, and all of our noses tilt slightly to the left or the right. Depending on which is more prominent, that's how you determine your good side. You probably already know which one it is based on instinct and past photos ("I don't know why, I just know I like this side better,"). And now you know why. 4. "I have to lose 10 pounds!" I understand this feeling. I've battled with my own weight for years, since middle school, and for the most part I've won that battle. But! I have spend many months in hiding because I've lost that battle too. There were months where I hid from my friends, avoided networking events and jumped out of impromptu photos like the devil was chasing me. I get it in a big way. Here comes another but: But I fully believe that I'm meant to serve creative entrepreneurs by creating beautiful photos that drive their businesses forward. I can't serve you if I'm hiding behind my computer, refusing to pose for photos. In order to connect with you, my audience, then you need to see my face, hear my voice and connect with my story. Without putting myself unique self out there, I'm lost in a sea of social media. Without photos of myself, I serve no one. And what about you? Who are you serving? And who are you not serving because you're hiding instead? Not a single one of your audience cares if you lose 10 pounds first. They need you to show up, just as you are, expertise in hand, ready to serve. Let's take the first step by getting in front of the camera. I'll make your photos painless, I pinky promise. You know the one: You swiped right on his profile pic, but when you showed up to meet in person, well... He's at least 10 years older than his picture, has a lot less hair and is missing some teeth (ok, that's an exaggeration, but you get it). Is your brand making the same mistake? This is a common mistake brands make with their visual message, but in reverse. Your services are FANTASTIC in person, but your profile pic (or any photo you put out there) is just, meh. Imagine if you did that on a dating app: You're gorgeous in person, but you used an "I-literally-woke-up-like-this" photo to attract attention. Nuh-uh. Nope. Not happening. So why would you risk it with your business? Yes, it's rad when your friend has a nice camera and can take an ok picture of you for social media. But audiences have a way of sniffing out when you haven't put your full effort and energy behind your offering—even when it's just a photo. And if you won't put your full energy behind the profile pic for your business on social media... what kind of energy would you put behind their business? Uh-oh. If you're ready to step up your visual messaging and put your full effort into our brand photos—get in MY inbox! Click here or the button below to shoot me a quick message with your questions. This is the story of a business. This is the story of a brand. This is how you connect to your audience. And I'm here to support you by bringing the art of storytelling to your business. It means sitting down with me, a hot cup of coffee and your favorite inspiration. We create a mood board that nails the aesthetic of your photo shoot. We pick the perfect location (or two) as a backdrop for your story; choose your props (hint: your brand is on point when you can mine your own home for photo props); and style a wardrobe with attitude. YOUR attitude. And lots of personality. We do this work so that on your shoot day, you're excited, comfortable, and most importantly, in your element. This is where the magic happens. This is where your personality shines through. This is where your brand becomes the story that clients connect to and engage with. So, I won't just take your photo. I'll tell your story. Your audience is waiting. When creatives get together for a shoot, magic is bound to happen. 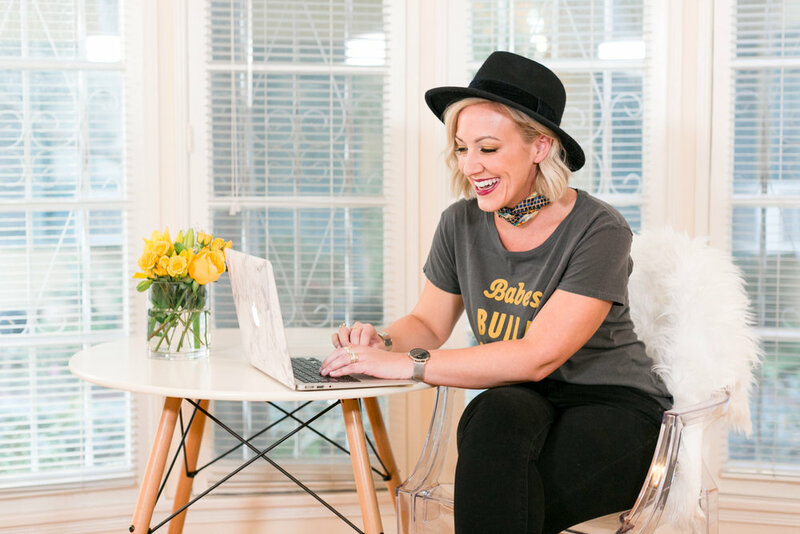 Shayna with Citrine Marketing has killer style, and her branding colors (love the yellow!) were the perfect backdrop. Clearly, we had a ton of fun on set. Portraits can be more than branding work or profile pictures—they can be something special you do just to celebrate yourself. 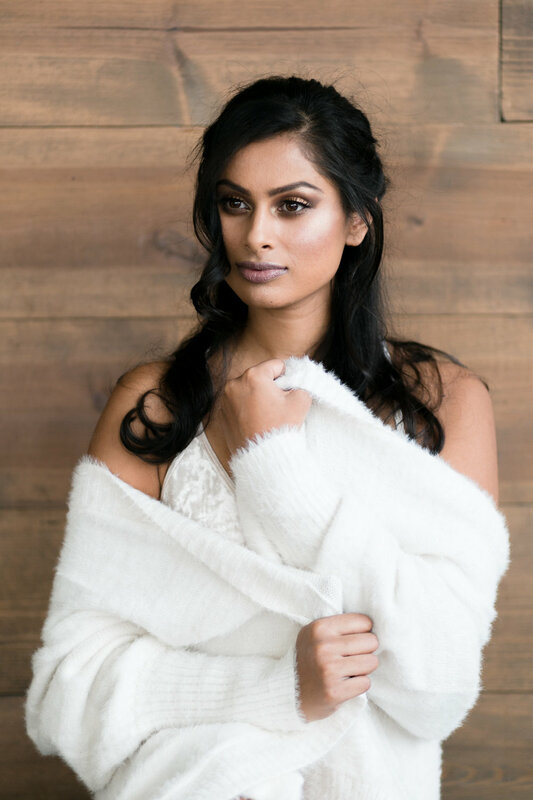 This lifestyle session borders on boudoir, and I love the intimacy and self-love that are pouring out Rima's eyes. They're hypnotizing and gorgeous!